Since the launch a few weeks ago of the Google Voice iPhone app. The developers at Google have been working hard to make improvements to the powerful iPhone app. One of the very amazing improvements is that Google Voice now supports iPad & iPod touch. Starting today, you can download the new version of Google Voice to your iPad or iPod touch and receive all the great features you get on the iPhone app. 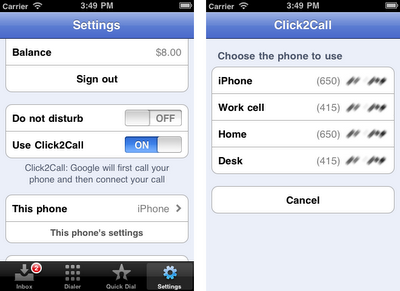 While you canâ€™t use your iPod or iPad as a phone, you can use the app to initiate Google Voice calls with your phones. Google calls this feature Click2Call. The user simply clicks the â€˜Callâ€™ button in the Google Voice app on their iPod or iPad and then select which of the phones they want to ring. Google Voice will then call your phone and then connect your call. When you enable Push Notifications, Google will automatically disable Text forwarding for you, so you wonâ€™t receive multiple notifications. You can send all callers straight to voicemail by turning on Do not disturb in the Settings tab. Place calls from the address book by adding a dedicated Contacts button to the Dialer tab. Sending text messages is now more streamlined since you donâ€™t need to press the OK button anymore. The Google Voice app is available to download from the Apple App Store today. Youâ€™ll need an iPhone, iPad, or iPod touch with iOS 3.1 or later and a valid Google Voice account. At this time, Google Voice is available in the U.S. only.